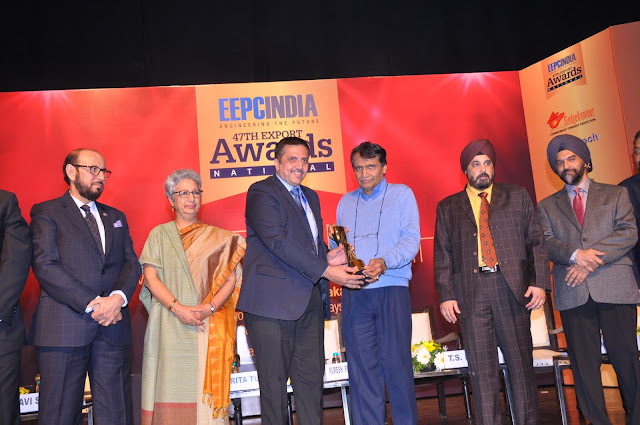 Bengaluru, December 26th, 2016: Toyota Kirloskar Motor (TKM) was recently awarded the Top Exporter Award for the year 2014-15, at the 47th Engineering Export Promotion Council of India (EEPC) National Award for Engineering Export Excellence. The award was conferred to TKM for their exemplary export performance as Merchant Exporter - Gold Trophy. Mr. Sandeep Bhagat, Deputy General Manager - Toyota Kirloskar Motor received the award from Shri Suresh Prabhakar Prabhu, Hon’ble Union Minister of Railways – Government of India, at an award ceremony held in Delhi. TKM carries the distinction of bagging the Export Excellence award by EEPC for 10 years at the Southern Region level, and 6 years at the National level, reiterating its contribution to the Indian economy, by exporting globally competitive and best in class auto parts & vehicles. TKM which has its world-class manufacturing plant in Bidadi in Bangalore Rural Karnataka, exports Completely Built Units (CBUs) like The Etios & Etios Liva and Auto Parts to Thailand, Brazil, Indonesia, Philippines, Argentina and South Africa. Expressing his delight on receiving the award Mr. Raju B. Ketkale, Senior Vice President, Toyota Kirloskar Motor said, “We are delighted to receive this award as we see it as recognition of our efforts in designing & developing the best in class cars. As a corporate, committed towards the growth of the country’s economy, Toyota Kirloskar Motor aligns all its processes to the Quality, Durability, and Reliability (QDR) Philosophy, which has resulted in the manufacturing of globally competitive automotive technologies and processes. Such recognition stimulates to further foray with more & more products into the international trade space, thereby fostering a spirit of healthy growth to excel in export performance in future too.